2018 reprint. First published 2000. Joint operations involve the closely synchronised employment of two or more service branches under a unified command. Military theorists and commentators now believe that they prove more effective in most circumstances of modern warfare than operations involving only one service or involving two or more services but without systematic integration or unified command. Many consider the Wehrmacht, Nazi Germany's armed forces, pioneers of "jointness". They point out that Blitzkrieg, the war-fighting style that brought the Wehrmacht stunning victories between 1939 and 1941, depended upon the close integration of ground and air (and sometimes naval) forces and that, even after the Blitzkrieg campaigns gave way to a drawn-out war of attrition, the Wehrmacht routinely conducted operations in a fashion that would today be called "joint". That is, elements of two or more services participated in close cooperation with mutually agreed goals, relatively little inter-service rivalry, and a command structure that, at least at the "sharp end" of operations, promoted, rather than inhibited, a spirit of jointness. As a result, the scholars claim, the Wehrmacht enhanced its capabilities and improved its combat effectiveness. This view of the Wehrmacht goes back a long way; back, in fact, to the war itself. For example, in 1941 the United States War Department, which, closely monitored events in Europe and North Africa, claimed in its Handbook of German Military Forces: "The outstanding characteristic of German military operations in the present war has been the remarkable coordination of the three sister services, Army, Navy and Air Force, into a unified command for definite tasks. These services do not [merely] cooperate in a campaign; rather their operations are coordinated by the High Command of the Armed Forces." Without becoming anachronistic — after all, jointness as a defined concept is very recent ― this monograph attempts something long overdue: an analysis of Adolf Hitler's influence on the Wehrmacht's efforts to integrate the employment of its forces and thereby increase its effectiveness. The study demonstrates two main points: first, that Hitler certainly understood the value of integrating his land, sea and air forces and placing them under a unified command (first Field Marshal Blomberg's; later his own); and second, that he also saw the benefit of placing them under operational commanders who possessed at least a rudimentary understanding of the [p. 5 starts] tactics, techniques, needs, capabilities and limitations of each of the services functioning in their combat zone. Hitler was thus innovative and several years ahead of his peers in the democracies, Italy and the Soviet Union. 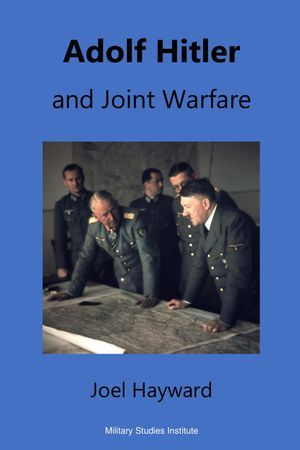 Yet this study concludes that, largely because of Hitler's unusual command style and difficulties with delegation, the Wehrmacht lacked elements that today's theorists consider essential to the attainment of truly productive jointness (a single joint commander or Joint Chief of Staff, a proper joint staff, a joint planning process, and an absence of inter-service rivalry) and that, as a result, it often suffered needless difficulties in combat. When Adolf Hitler became Chancellor in January 1933, the Wehrmacht did not yet exist as three separate service branches. The Treaty of Versailles had left Germany with a weak defence force, the Reichswehr, comprising a small army and a smaller navy, but no air force. Even though its bi-service shape owed its existence to external influence, the new Reichswehr did at least represent a step towards unification. Yet it was a small step. The Army and Navy shared common legal, budget and intelligence agencies, but their integration remained superficial, with the services wanting and having full independence in important matters of command, doctrine and training. Moreover, Germany's traditional focus on land warfare and its limited experience of seapower — based on its geographical position and self-perception as a continental power — and the relative strengths of the two permitted services, ensured that most German politicians and military leaders perceived the Army as the state's primary military force. Should war occur, they believed, the Army's leaders would automatically assume paramount military command functions. An "army man" by inclination and experience, Hitler shared this view in his first year or two in power. He showed relatively little interest in air and naval matters, but devoted much energy to winning the Army's trust and support. He courted General Werner von Blomberg, whom President Paul von Hindenburg had appointed Reichswehr Minister in January 1933 (immediately before Hitler assumed office) and Colonel Walter von Reichenau, Blomberg's Ministerial Office Chief. Blomberg and Reichenau quickly recognised that Hitler aimed to expand Germany's military strength, which would involve the creation of an air arm of some form, so they began enlarging the Reichswehr Ministry's offices in order to facilitate the process. [p. 6] Early pioneers of what we now call jointness — they used the term Einheit, or unity — Blomberg and Reichenau envisaged the eventual creation of a single armed forces staff which would not only perform the functions of the current Ministry, but would also exercise joint strategic and command authority over all services and sections of the armed forces.2 This planned entity would leave individual service C-in-Cs with considerable independence within their services, whilst integrating their key functions in a systematic fashion under a unified command. Hitler had no formal command authority over the Reichswehr until Hindenburg died on 2 August 1934. The previous day the Reichstag had passed a law, to take effect upon Hindenburg's imminent death, combining the office of President with that of Chancellor. Consequently, "all powers previously accorded to the Reich President" passed to "the Führer and Reich Chancellor, Adolf Hitler." Thus, as head of state Hitler became Supreme Commander of the Armed Forces (Oberbefehlshaber der Wehrmacht), with constitutional — or at least "legal" — authority over the Reichswehr.3 Encouraged by Reichenau, Blomberg immediately ordered "all soldiers of the Wehrmacht" to pledge an oath of allegiance — not to the Reich Constitution, as it was until December 1933, or to the Volk and Fatherland, as it was afterwards — but to the new Supreme Commander himself. Although now formally the Reichswehr's Supreme Commander, Hitler exercised his prerogatives in few matters, except for personnel, in which he maintained interest, and left Blomberg, Reichenau and the individual service heads (General Werner von Fritsch, the Army's C-in-C, and Admiral Erich Raeder, the Navy's) to manage their affairs without excessive hindrance.4 Hitler felt comfortable with Blomberg's continued emphasis on the integration of all services and offices of the armed forces and remained aloof from the debate which this emphasis generated within the services. The debate — which usually involved exchanges of memoranda, but sometimes involved direct dialogue — revolved around the relative merits of die Einheit und die Integrierung (full integration under unified command), increasingly advocated by Blomberg, and die Koordinierung und die Zusammenarbeit (close coordination and full cooperation — but not unity — of independent services), wanted by Fritsch and Raeder and their Chiefs of Staffs. Further, Hitler seldom involved himself in the debate over what form Germany's new air force would take, although he clearly supported Hermann Göring’s desire to make it independent, [p. 7] not subordinate to army command as it had been during the Great War. This support, and Göring’s own power and prestige, ensured that the Luftwaffe emerged — after Hitler announced its existence on 9 March 1935 — as an independent service equal in status to the Army and Navy. Göring added C-in-C of the Luftwaffe to his list of high offices, which included Aviation Minister and Minister-President of Prussia. Blomberg had raised little opposition to the creation of an autonomous Luftwaffe. Hitler and Göring clearly wanted it, and they were hard to oppose. Also, because an autonomous Luftwaffe would give Blomberg authority over a third service, it would provide him with greater power, fit nicely with the joint command structure he aimed for, and reduce the Army C-in-C's sphere of influence.5 The latter, along with most other senior Army officers, had jealously wanted a reversion back to the Great War model — which resembled the interwar American system — of an air service that remained a Hilfswaffe (auxiliary arm) under Army command. On 21 May 1935, Hitler himself took a big step towards jointness by explicitly formalising and making public his support of Blomberg's authority over all three services. In the innovative Military Service Act passed that day, the Reichstag outlined the shape of the tri service Wehrmacht ("comprising the Army, the Navy and the Airforce") that henceforth replaced the bi-service, Versailles-imposed Reichswehr. This development signalled Hitler's acceptance of Blomberg's aims for integration of the services with a unity of command. Providing this unity "in a far greater degree than had ever existed in the Imperial Army,6 the Act stipulated that the Führer would remain Supreme Commander (Oberste Befehlshaber), whilst, subordinate only to him, Blomberg, as newly-designated Minister of War, would exercise command functions over the three services as C-in-C of the Wehrmacht (Oberbefehlshaber der Wehrmacht). This gave Blomberg — at least on paper — more military authority than any other peacetime general in Prussian and German history. Blomberg's Ministerial Office became the Wehrmachtamt (Armed forces Office), an ever­-developing structure consisting of various branches for military law, finance, home and overseas defence, war economics, and armaments. On 1 October 1935 General Wilhelm Keitel, a very efficient administrator, succeeded Reichenau (who left to command Wehrkreis VII in Munich) as head of the Wehrmachtamt. Keitel quickly embraced his boss's vision and became passionate [p. 8] about jointness — that is, about Einheit, a unified command over the three service branches exercising not only administrative authority, but also joint planning and operational command authority. He worked energetically to integrate various offices and agencies and to standardise as many of the three services' procedures and policies as possible. Before February 1938, however, the Wehrmachtamt was not formally a joint service High Command (Oberkommando der Wehrmacht; OKW), as General Walter Warlimont later maintained, basing his claim on the fact that Keitel and others sometimes used this designation casually in correspondence.7 The Wehrmachtamt was merely Blomberg's administrative office. He was a joint commander and had full authority over the three services, but Keitel and his other personnel did not. General Heinz Guderian noted after the war that the organisation of the Wehrmacht's higher echelons in the years between 1935 and 1938 was "nearly ideal, in theory. But, in practice, the actual situation was unfortunately quite different.8 The panzer leader — and most other generals and admirals writing on this subject after the war9 — rightly considered Göring the major problem. The latter possessed far greater authority and wider powers in the Reich than Fritsch and Raeder, the other service C-in-Cs. By May 1935 Göring was already the second most powerful man in the Reich, with many Party and Government posts including Speaker of the Reichstag, Aviation Minister, Prussian Minister-President and Commissioner of Foreign Exchange and Raw Materials. Fifteen months later he would also become Plenipotentiary for the Four Year Plan, which gave him virtually dictatorial controls to direct the German economy and even, in some circumstances, the authority to issue directives to Blomberg. Moreover, he was Hitler's close confidant and, after 7 December 1934, designated successor. As a result, it proved difficult to integrate Göring as the Luftwaffe's C-in-C, into the unified Wehrmacht command that Blomberg was attempting to control and develop. In Blomberg's and Hitler's minds the three service C-in­-Cs should be of equal status under him, and his rank as Wehrmacht C-in-C should be higher and authority greater. In terms of rank, this certainly proved true during the pre-war years. When Hitler took office in 1933, Göring held no military rank. He had risen to Lieutenant in the Great War, but left military service at its conclusion with the rank of Captain. On 30 August 1934, the enactment of one of the last decisions made by the recently deceased President Hindenburg upset many senior officers. It promoted the bulky demagogue — bypassing five military ranks and the expectation of [p. 9] about twenty years' service — to General der Infanterie (equivalent to a Three Star General). He apparently did this in order to give Göring legitimate military authority over the secretly developing Luftwaffe. Remaining a civilian or reverting to Captain would have effectively excluded Göring from commanding the Luftwaffe. Proud of his reputation as Germany's second man, Göring found his military subordination to Blomberg distasteful and craved, as he sometimes told confidants, Blomberg's position as the Reich's leading soldier. Yet, aside from a few moves designed as slights but not as open challenges — such as attending, without having gained Hitler's permission, the funeral in October 1934 of the murdered king of Yugoslavia as the Wehrmacht's representative — he made no open moves before February 1938 to change the situation. Instead, he jealously watched as Blomberg discussed military matters with the Führer or represented him at official functions, such as the coronation of George VI, the kind of grand occasion that Göring adored. Göring's actions did erode the spirit of jointness that Blomberg was struggling to generate. He routinely used his high offices and his closeness to Hitler to circumvent Blomberg and to gain advantages over the other services in matters relating to the selection of personnel, the distribution of funding, the procurement and allocation of raw materials and the development and testing of new weapons and hardware. This bitterly annoyed Blomberg, Fritsch and Raeder. The two service C-in-Cs felt that Göring, a newcomer anyway, was not acting as an equal, much less as a colleague, so they would not bother to treat him as one. Blomberg doubtless sympathised. Despite considerable effort, he never managed to create a harmonious and collegial "co-equal" working relationship between the three C-in-Cs. This situation did not improve; even after Hitler assumed direct control of the Wehrmacht in February 1938 he often felt shocked at the [p. 10] vehemence of the professional rivalries and petty jealousies of his service heads and sometimes even had to mediate in their squabbles. Blomberg did his best to foster a joint spirit, however. He was astute enough to realise that inter-service rivalries often grew from biased attitudes about service prerogatives and from inadequate knowledge all the tactics, techniques, needs, capabilities and limitations of the other services. With the Führer's support, he therefore created the world's first purpose-built tri-service higher military academy — the 1930s equivalent of a modern Joint Services Staff College. On 15 October 1935 the Wehrmachtakademie (Armed Forces Academy) emerged as Blomberg's primary means of fostering a joint spirit in the Wehrmacht and an integrated, cooperative approach to operational planning and training. It would provide senior general staff officers and key civilians from all three services with lengthy and intensive training in preparation for their subsequent postings as Vereinigte Streitkräfte (joint services) specialists to the Wehrmachtamt and the High Commands of the services themselves. Hitler clearly liked the idea — at least initially — and solemnly rededicated the building (the old War Academy in Potsdam, closed since 1920 ­according to the Versailles "dictation"), thus publicly expressing his support for joint services officer training. Despite the Luftwaffe's doctrinal focus on close air support, [p. 11] this school also placed relatively little emphasis on instruction in integrated bi- and tri-service warfare or tuition in the strengths, limitations, tactics and techniques of the other services.15 As it happened, inter-service rivalry and the purported pressures on mid-level and senior general staff officers forced the Wehrmachtakademie to close shortly after Blomberg, its main protector, fell from grace in February 1938. Hitler, distracted by other far more pressing issues — particularly the "Czech problem" and then his aggressive plans for Poland — probably barely noticed the academy's demise and certainly spared no time to keeping it alive if he had. In his final year as War Minister and the Wehrmacht's tri-service C-in-C, Blomberg hastened his campaign to make the Wehrmacht unified not only on paper, but also in practice. Realising that Hitler's expansionist policies made war increasingly likely — and with the Führer himself speaking of war's inevitability — Blomberg felt a strong need to create and impose a joint operational planning process. On 24 June 1937 he issued a Weisung far die einheitliche Kriegsvorbereitung der Wehrmacht (Directive for the Wehrmacht's United War Preparations).16 In this document, doubtless drafted by Keitel, Blomberg encouraged the three service branches to coordinate their operational planning in order to enhance their overall combat effectiveness during war. This document later proved troublesome for the Wehrmacht. At the International Military Tribunal held in Nuremberg during 1945 and 1946, Allied prosecutors repeatedly cited it as "proof' that Germany planned to invade Czechoslovakia as early as June 1937. This was an extravagant reading; the document did discuss several possible war scenarios, and mentioned conflict with Czechoslovakia as increasingly likely, but provided no explicit reference to the Nazi state's foreign policy or probable moves. Its main intention was to get the three service branches thinking jointly as they prepared for each scenario. The document also proved troublesome at the time of its issue. The three service C-in-Cs had never received anything like it — after all, a joint planning process did not exist in any nation — and considered it a bitter pill to swallow. Their immediate response was to spit it back at Blomberg with angry denunciations that they quickly transformed into memoranda written in language that barely disguised their distaste. [p. 12] Fritsch felt hottest, seeing Blomberg's directive as a diminution of the Army's and his own powers. In an angry memorandum sent to Blomberg in August 1937,17 Fritsch explicitly rejected the Wehrmacht leader's emphasis on jointness and challenged his tri-service joint command authority. He argued at length that, even though the Air Force and the Navy were "entitled to the means and facilities necessary for their difficult tasks, and in this they are on a level of equality with the Army," the latter remained most important "since it alone can, by its fighting, produce a victorious decision". He justified this by pointing to Germany's geographical position, probable opponents, and past experiences, all of which revealed that land warfare would always prove the decisive factor in Germany's overall strategy. Thus, he insisted, the Army's high command must assume responsibility during wartime as an Armed Forces General Staff for all high-level military planning. A separate Wehrmacht High Command was not only superfluous, but also unhelpful. Moreover, the Army's C-in-C must serve as the head of state's principal adviser on all matters concerning the overall conduct of war, including naval and air matters, and must be his sole adviser on questions of land warfare. Fritsch also informed Blomberg that he would rather resign than submit to what he considered further interference. Blomberg retaliated with a threat of his own resignation if the Army leader insisted on drawing Hitler into the squabble by showing him the memoranda. This gave Blomberg the upper hand; both men knew that if Hitler had to choose between them, he would undoubtedly favour Blomberg. Colonel Friedrich Hossbach, the Wehrmacht Adjutant, managed to prevent this showdown by persuading Fritsch to step back and leave matters as they were.18 Blomberg became more conciliatory and, after discussing the problem with Fritsch again on 1 September 1937, promised a closer working relationship, with weekly discussions on command and operational issues. Their "agree to disagree" stance merely postponed resolution of the thorny problem of joint operational planning. Hitler himself resolved it — or so he thought -­in the weeks following the removal of both Blomberg and Fritsch. Before that grim period, however, Blomberg pushed on with his crusade for increased jointness. In mid-1937 he had Keitel instruct the three service branches to conduct their first joint manoeuvres in order to test the effectiveness of their coordination and cooperation.19 To stress that these were indeed joint manoeuvres involving three co-equal services, he delegated their direction to Colonel Alfred Jodl, Chief of the War Ministry's National Defence Department, [p. 13] which Blomberg and Keitel were already transforming into an embryonic joint operations staff. The Army nevertheless dominated the controlling headquarters, with General Franz Halder, who headed the Army's training department, assuming command. The week-long joint manoeuvres took place in Mecklenburg during late September. Hitler believed them significant and attended both the full exercises and the joint military tattoo staged for Mussolini, then in Germany on a short tour, and for delegations from several countries.20 Germany's surface fleet and small submarine force joined air and army units in joint exercises, and by all accounts the manoeuvres went well, with little friction evident between the services despite the scepticism of Fritsch and General Beck, Chief of the Army General Staff. A relieved Keitel later considered "the whole venture as having been highly successful," and praised Jodl for a job well done.21 He also commended Halder for his effectiveness in commanding the Wehrmacht's first joint exercises. This was, he said, an "onerous role," but Halder had performed masterfully. On 1 October 1937, only a few days after the joint manoeuvres, Blomberg arid Keitel took another step towards jointness. With Hitler's approval they reorganised Keitel's Wehrmachtamt (Armed Forces Office) in order to separate Blomberg's command functions from his purely ministerial ones. Keitel amalgamated several larger offices and branches and created several others, most important being an embryonic Wehrmachtführungsamt (Armed Forces Operations Office). He intended this office as the Wehrmacht's central planning agency, which would eventually coordinate doctrinal ideas and operational plans during peace and the campaigns themselves during war. At its head Keitel placed the capable Jodl, who enthusiastically supported his goal of unified command and integrated warfare. However, the crisis in the German military leadership, which culminated in February 1938 with the removal of Blomberg and Fritsch and with Hitler's reorganisation of the command structure, occurred before Keitel and Jodl could make any significant changes. It is clear, then, that during the period from Hitler's assumption of power in January 1933 to his reorganisation of the Wehrmacht command in February 1938 the German armed forces took small but significant strides towards jointness. Blomberg, more innovative — at least in this regard — than most historians have acknowledged, worked hard to realise his vision of integrating the three services and placing them under unified command. Keitel, his able assistant, shared the [p. 14] vision and also pushed for its realisation. Hitler's role in this process was rather like that of his contribution to the war-fighting style now known as Blitzkrieg. He did not conceive the concept — Blomberg deserves the laurels for Wehrmacht jointness just as Guderian does for Blitzkrieg — ­but he liked new ideas, considered this one worthy and became its patron, sometimes placing his considerable weight in support. The Military Service Act of 21 May 1935, giving Blomberg unprecedented command authority over the three services, is a prime example. Hitler initiated this major departure from German military tradition even though he realised it would cause angst in the conservative ranks of senior officers. The reasons for the military reorganisation in February 1938 are firmly established and need no recounting. To his grave disappointment, Hitler felt unable to retain Blomberg, whose ill­-considered marriage to a woman previously active in "lewd behaviour" could not be overlooked because of the hostility it generated among the officer corps. With far less disappointment, and probably some satisfaction, Hitler also released Fritsch, who found himself accused (wrongly, as it transpired) of homosexual activity. The removal of Blomberg, War Minister and tri-service Wehrmacht C-in-C, and Fritsch, Army C-in-C, left Hitler struggling for a solution to the problem of military command. He did not feel he could trust anyone else, even Göring, with the absolute tri-service authority he had given Blomberg, and he disliked or considered unworthy the candidates nominated by the services. He also realised that only a firm hand could create stability and prevent squabbles and power-grabbing among his senior officers. General Guderian later recalled that Hitler also felt dissatisfied by the actual state of jointness within the Wehrmacht, and recognised that this stemmed from the unwillingness of key generals to submit to even Blomberg as a single tri-service commander.22 From this Hitler concluded that only one man in the Reich possessed the status and authority to demand and gain the subordination of the three service C-in­-Cs: himself. His subsequent actions had profound implications for Wehrmacht jointness. He replaced Fritsch as Army C-in-C with Walter von Brauchitsch, this being a far easier move than finding a replacement for Blomberg. Göring made his ambition clear: he wanted Blomberg's job. Hitler [p. 15] rejected the idea, considering the airman unfit for this highest of positions. This essentially ruled out the appointment of any senior army officer, to whom, as Hitler well knew, Göring would never submit. Blomberg made a fateful suggestion: Hitler should leave the position of War Minister unfilled and simply exercise full command authority himself. After all, he was constitutionally the Wehrmacht's Supreme Commander already. Hitler liked the idea, especially as it fitted with his notion that only he could control the troublesome three service C-in-Cs. After a brief period of reflection he decided he would indeed take direct charge of the armed forces. On 4 February 1938 he replaced the War Ministry's Wehrmachtamt (Armed Forces Office) with a new, more biddable authority, the Supreme Command of the Armed Forces (Oberkommando der Wehrmacht, or OKW), from which Brauchitsch, Göring ,and Erich Raeder, the respective Army, Air Force and Navy C-in-Cs, would receive coordinating instructions and guidance on the overall conduct of joint endeavours. Adding direct command authority to his constitutional prerogatives, Hitler appointed himself the OKW's Supreme Commander (Oberster Befehlshaber) and Keitel, with the title Chief (Chef), as his principal military advisor and the new authority's administrator. The OKW's configuration, and Keitel's appointment, both demonstrate that Hitler saw value in Blomberg's long pursuit of jointness and that he intended to further the process, not inhibit it. Scholars and commentators have always made much of the conversation between Hitler and Blomberg about who should run the OKW. It is true that during this conversation on 25 January 1938 Hitler asked the outgoing Wehrmacht commander about "that fellow" who ran his ministerial office and received the reply, "Oh, Keitel, ... He's no more than my Chef de Bureau (office manager)." Hitler then said: "That's exactly the kind of man I'm looking for." Yet it is also true that, before the Führer agreed to appoint Keitel as Chief of the OKW, he and Blomberg [p. 16] discussed Keitel's career and character at length. Blomberg doubtless told him that one of Keitel's main assets, aside from his compliant nature and administrative talents, was his total commitment to the concept of Wehrmacht jointness. When Keitel had first learned on 25 January 1938 of Blomberg's imminent resignation, they met to discuss the future. According to Jodl's diary, Keitel and his departing boss firmly agreed that "the Wehrmacht's unity of command must remain and be protected.24 Even so, Keitel tearfully lamented to Jodl later that day that all their efforts to increase jointness would prove in vain. The latter refuted this. "The man may go," he said, referring to Blomberg, "but his work must remain." Hitler may well have saved the formal unity of the Wehrmacht, at least superficially, but he had no plans to give either the OKW or Keitel himself any command authority over the three service branches. In his view, which soon became clear to all, the OKW would merely serve as his administrative staff and Keitel as his Chef de Bureau. Hitler alone would possess tri-service command authority. Keitel's many flaws never included arrogance. Warlimont later commented that his "personal modesty was great. "27 He humbly accepted the limitations of his new post and did not ever attempt to impose his own will on the service C-in-Cs as any kind of tri-service commander himself. This does not mean that he lacked influence. At least initially, in the eighteen months before war erupted, he had the Führer's ear and consequently managed to win several small victories. In particular, he persuaded Hitler to appoint Brauchitsch as Fritsch's successor, even [p. 17] though Hitler favoured Reichenau, and he had his own brother appointed as Chief of Army Personnel, which, aside from other professional reasons and perhaps a bit of nepotism, he hoped would ensure that officers agreeable to his ideas on jointness would rise through the ranks. He also had Hitler dump Hossbach (this wasn't hard; Hitler loathed him for his role in the Fritsch affair), who openly championed the Army's traditional view that during wartime its high command would assume overall control of operations. Keitel recommended that the Führer replace Hossbach as OKW Adjutant with Major Rudolf Schmundt, whom he trusted and considered well-disposed to the idea of unified command and integrated warfare. Hitler accepted the recommendation, making one of his better appointments. Schmundt proved a capable and loyal aide de camp until his fatal wounding in the assassination attempt against Hitler on 20 July 1944. If Keitel thought that the OKW's creation and Brauchitsch's appointment in February 1938 would somehow silence criticism among the military "brass" of the joint concept that the new unified command authority represented, he was sorely mistaken. Grumbling continued and occasionally found expression in opinionated memoranda. The most important of these documents came — to Keitel's shock — from Brauchitsch, who succumbed to pressure from Beck and other senior Army officers to take a stand on this issue. Brauchitsch submitted his memorandum to the OKW on 7 March 1938,28 expressing sentiments — and even actual sentences — that seemed almost identical to those in Fritsch's memorandum of the previous year. Brauchitsch conceded that the complex and technological nature of modern war and the introduction of airpower as a third service meant that increased tri-service coordination, control and operational planning had become essential. He therefore conceded that the empowerment of a single Supreme Commander with absolute authority over the services was necessary. However, he considered the imposition of the OKW between the Supreme Commander (in this case Hitler) and the three service C-in-Cs to be intolerable, mainly because those C-in-Cs needed to be able to discuss critical issues directly with the only person who had the power to make final decisions: the Führer himself. Also, Keitel's position as Chief of the OKW was entirely superfluous unless he received executive powers, which would also be out of the question because it would reduce the C-in-Cs to the status of inspectors-general. Like Fritsch before him, Brauchitsch concluded by insisting that the senior advisor on all matters concerning the overall planning and conduct of war [p. 18] should be the Army's C-in-C, supported by his Chief of Staff. The Operations Staff of the OKW, he proposed, should be incorporated into the General Staff of the Army. Hitler and Keitel were not impressed that Brauchitsch would take such a disagreeable stance only a month after assuming the highest post in the Army, especially as he was also becoming annoying over the issue of Fritsch's reinstatement. Keitel responded on 19 April 1938 with a lengthy memorandum of his own29 — although he doubtless submitted it to Hitler for approval; the Führer's "voice" certainly comes through clearly in places. Keitel stated in this memorandum that the command structure imposed on 4 February was the most logical and effective arrangement. In any event, he stressed, the new structure was merely Hitler's "theoretical continuation" of the steps undertaken in recent years under Blomberg's guidance. Keitel argued that the "basic principles of the total war of the future" meant that the various facets of warfare could not be divided and organised by different persons and staffs. On the contrary, "they should be coordinated in the closest possible manner" not only by a single Supreme Commander, but also by a single tri-service staff, namely the High Command of the Wehrmacht. He then refuted what Brauchitsch had written about the impossibility of a Supreme Commander being able to direct and coordinate all political, economic and military aspects of war. It was precisely because the supreme commander needed to manage all these aspects effectively that he must have the assistance of a staff with wide-ranging powers to coordinate the overall activities of the nation at war. More significantly, Keitel denied that land warfare would always prove the decisive factor in Germany's military fortunes. In the case of war with a nation lacking a common land frontier with Germany, such as England or Russia, the main effort of the war might lie with the Navy or the Luftwaffe. Moreover, during wartime the relative importance of any one service over the other two would doubtless rise and fall as circumstances changed. Therefore, it made no sense to place command of the three services in the hands of the Army, or of any service for that matter. In addition, normal human tendencies towards jealousy and favouritism would make it difficult for any one service C-in-C to deal fairly with all when it came to the procurement and allocation of men and materiel. [p. 19] Keitel then stated that the new command structure created by Hitler would provide for the integration of the three services without interfering in their C-in-Cs' responsibilities: The OKW would issue guidelines on overall planning and policy, but would not issue day-to-day directives. He added that Hitler had so far never violated this principle. Closing the substantive section of his memorandum, Keitel stressed the need for jointness and added that "every progressive measure demands sacrifice." Just as the united German nation owed its existence to the willingness of individual states to give up their sovereignty, so also would a united Wehrmacht owe its existence to similar sacrifice. There could be no integrated Wehrmacht, he said, "unless the Army, the Navy and the Air Force consider themselves as only a part of the whole and willingly cede to the Armed Forces Commander whatever is necessary to it for united organisation and command." The Chief of the OKW concluded by summarising the steps towards jointness taken by other nations, including England, France, Italy and Russia. All had moved in what he considered the right direction, yet none had kept up with Germany, which had "set the pace as far as a uniform command of the Armed Forces is concerned." Germany's innovations had inspired them, he boasted, and their own small steps reflected the fact that they could no longer overlook the obvious advantages that the Wehrmacht was gaining. Shortly after Keitel submitted this memorandum, Hitler intervened to end once and for all the debate over Wehrmacht unity. On 18 February 1938 he emphatically and publicly confirmed the newly created OKW as being the final, and in his view best, form of command structure. He also gave Keitel a renewed assurance — which he actually began violating within weeks — that he would "never make a decision affecting the Wehrmacht without first hearing the views of his Chief. "30 Strangely, Keitel also found himself supported by both Raeder and Göring, who vigorously defended the new organisation. Their support did not necessarily reflect a commitment to the joint concept; Raeder and Göring probably saw this mainly as a prime opportunity to curry Hitler's favour at the expense of their rival for his affection: the Army. To close this section on Hitler's assumption of full tri-service command powers and his creation of the OKW, it needs to be said that these acts did not necessarily result in greater distance between Hitler and the three service C-in-Cs. On the contrary, Blomberg's removal gave [p. 20] the C-in-Cs direct access to him as their Supreme Commander. Keitel never interfered and Hitler seldom used him as an intermediary. In fact, the Führer often failed to inform Keitel that he was meeting one or more of the C-in-Cs, and instead used his adjutants to make the necessary arrangements.31 Although this situation doubtless pleased the C-in-Cs and their staffs, it steadily eroded the credibility and status of the OKW, which many senior officers always considered superfluous. The OKW certainly never functioned as a joint staff in the modern sense. Perhaps most importantly, it never had a joint planning process. When Hitler formed it in 1938 he divided it into four main departments (again in keeping with Blomberg's and Keitel's prior designs): the Wehrmachtführungsamt (Armed Forces Operations Office), responsible for operational planning; the Amt/Ausland Abwehr (Office of Foreign Intelligence), responsible for foreign and counter­intelligence; the Wirtschafts-und Rüstungsamt (Economic and Armaments Office), responsible for the war economy-and the procurement and distribution of war materials; and the Amtsgruppe Allgemeine Wehrmachtsangelegenheiten (Office for General Armed Forces Affairs), for general tasks. For this study, at least, the most important department was the Armed Forces Operations Office, initially headed by General Max von Viebahn. It included the National Defence Branch (still headed by Jodl) and the Armed Forces Signals Communications Branch. Viebahn did not last long. He had a nervous breakdown during the crisis preceding the Anschluss with Austria in March 1938 and had to be removed from office by Keitel, who assigned his duties (but not yet his title) to Jodl. The latter performed these functions until October 1938, when he took a divisional command posting before returning in August 1939 to take up the formal post of Chief of the Operations Office (re-designated in August 1940 as the Operations Staff). Warlimont had taken his place during his ten-month absence and became his deputy upon his return. Before war started in September 1939, Hitler knew very little about Jodl and had probably never met him. Yet he soon came to rely heavily on him and expected his presence at all key military meetings and his input into most important decisions. One might think, then, that Jodl [p. 21] had such influence in his role as Chief of the Operations Office that he was able to impose a uniform joint operational planning process over the three services. He was never able to do so, however, and the Wehrmacht remained without an adequate joint planning process throughout the entire war. Hitler liked doing business this way. Rather than having one joint operations staff provide him with counsel on military matters and issue uniform plans to the three services, he preferred to receive advice and plans not only from Jodl's office, but also, in a spirit of direct competition, from each of the services involved in the particular operation. Deliberately bypassing traditional chains of command and ignoring the inter-service tensions this competition caused, he would then weigh up what he alone considered the relative merits of each plan and accept one or, on some occasions, a clumsy combination of both. Once Hitler decided on the best strategic conception — the OKW's, the OKH's or his own — he outlined what he wanted to Jodl, who would transform it into a draft directive. Hitler would then approve the draft, or demand changes, before Jodl's office forwarded it to the various high commands. When planning the invasion of Poland, Hitler again favoured the OKH over the OKW, accepting after a few alterations the basic plan proposed by Brauchitsch and Halder and assigning to the OKW Operations Office only the task of drawing up the timetable to be followed. During the Polish campaign itself, Hitler and Brauchitsch met several times to discuss progress and [p. 22] organise the next stages. Yet throughout the entire campaign Brauchitsch never once telephoned Keitel or Jodl to coordinate their activities.33 Although all three services participated, with the Army and the Air Force generally integrating their operations adequately as they performed the lion's share of combat, Poland was an "OKH theatre", and Brauchitsch wanted to make this clear. Keitel and Jodl, however, benefited from their close proximity to Hitler. They accompanied him to the front and, with Brauchitsch too busy prosecuting the war to be a daily visitor to Hitler's command train, began to play an increasingly important role in Hitler's planning processes. Jodl's sharp intellect, total dedication and agreeable personality immediately impressed Hitler, who respected his strategic talents and relied on him as his closest counsel — except for a brief but bitter break in 1942 — until war's end. This relationship, more than anything else, enabled Jodl's office to function in some contexts as a joint staff capable of planning operations that involved the coordinated effort of all three services. This does not mean, of course, that the OKW Operations Office ever created or issued directives independent of the will of the Führer. Hitler would not have tolerated this. Yet he did begin listening to Jodl more, feeling that he understood his wishes and intentions better than Brauchitsch and Halder did. By the time planning for the campaign against France commenced in the days following Poland's collapse, Jodl was even personally providing Hitler's daily situation reports. Hitler remained a man of independent thought, however. He liked neither the OKW's campaign plan nor the traditional plan first advanced by the OKH and, after discussing his own ideas about an armoured thrust through the Ardennes Forest with the like-minded General Manstein, demanded that the OKH dramatically adapt its plan to fit those ideas. He also ignored Jodl's constant opposition to the strategy contained in the new plan34, simply telling him that that staff must draft the directives and issue them to the three services. Göring soon learned that he had more to grumble about. Keitel and Jodl succeeded in persuading Hitler to appoint an Army general as a single joint task force commander.37 As outlined below, this prompted Göring to insist that he would not subordinate his air units to an Army officer, even one who — as in this case — worked directly under the authority of the OKW, not the OKH. Jodl's diary reveals that he and Keitel also infuriated the OKH by selecting for the Norwegian campaign the Army divisions that they, with no input from Brauchitsch or Halder, considered best suited for the task. This caused what Jodl called "violent protests," most of them simply ignored by Hitler, who also did not really consult the OKH about the timing of the two major campaigns of 1940. Instead, he accepted Jodl's advice that success in Norway should be guaranteed before he initiated the attack on the Low Countries and France. During the Scandinavian campaign itself — codenamed Weserübung (Weser Exercise) -­Jodl demonstrated exemplary leadership as he coordinated joint operations and, remarkably, taking the role that rightly should have been Keitel's, worked closely with the Führer as the type of tri-service commander that Blomberg had long envisaged. Having observed this first-hand, Warlimont commented after the war that Jodl had acted as a "second Chief of General Staff,"38 effectively usurping Brauchitsch's and Halder's positions and functions. As it happened, the entire campaign might well have suffered a major reverse had not Jodl pressured a panicky Hitler to stand firm and make certain strategic decisions during a period of apparent crisis. That period soon passed, and victory in Norway quickly followed, but Hitler never forgot the debt he owed Jodl, whose prestige, like that of his Operations Staff, was at its zenith during the Scandinavian campaign. Keitel, apparently not minding that Jodl had also usurped his own role — which allowed him to withdraw from strategic and operational problems and get on with his many other [p. 24] responsibilities — recalled with pride: "For the first time the OKW began to function as a working headquarters for Hitler's overall command of the armed forces, as it took over the unified command of a theatre of combined operations by the Navy, Army and Air Force. "39 He added that the Scandinavian campaign "proved an ideal example of how well a joint and centralised command could be concentrated in the hands of the OKW Operations Staff'. It may have proved this to him and Jodl, and it did indeed establish a pattern for what became known as "OKW theatres," but it made a most unfavourable impression on the three service C-in-Cs and their staffs, who resented what they considered a diminution of their prerogatives. The service commanders gained some consolation from the fact that Jodl's tri-service Operations Staff played only a minor role in their stunningly successful campaign against the Low Countries and France, which commenced while Jodl was still preoccupied with Norway. Having shown that he could conduct a campaign without them, but now wanting to eliminate their dissatisfaction, Hitler worked closely during the French campaign with Brauchitsch, Halder and Göring, and left Jodl, who nonetheless remained one of his closest and best trusted confidants, with little to do except provide counsel and encapsulate their wishes in formal directives. The French campaign did not, however, represent a rapprochement between Hitler and the OKH. On several issues — such as the form of Holland's occupation authority, the security of the attack's southern flank and the destruction of Allied forces trapped at Dunkirk — Hitler overrode Brauchitsch's and Halder's frantic objections. Not that he embraced the views of the OKW Operations Staff; he almost forgot it existed and, although he routinely sought and usually ignored Jodl's advice, certainly never accorded his staff the status it warranted as the Wehrmacht's only joint operational planning agency. Jodl deserved some of the blame. Thriving on Hitler's trust in his strategic skills and wanting to reduce the number of voices Hitler heard, he kept Warlimont and the other key members of his Operations Staff away from Hitler's command train or headquarters unless they were needed for specific reasons. He communicated with them primarily by telephone and couriered post. On many occasions he even fulfilled his executive duties — such as drafting orders and directives — without bothering to consult Warlimont and his operations team.40 This suited [p. 25] Hitler, who liked to keep his entourage small, did not care for Warlimont anyway and liked the way Jodl drafted directives and orders almost immediately. Yet it doubtless gave him the impression that Jodl was essentially a one-man "think tank," whose staffs primary functions were to supply up-to-the-minute information, prepare strategic and operational proposals upon request and draft the orders and directives agreed on at the highest level. In other words, he did not consider Jodl's staff as an independent military planning agency. The distance between Jodl and his staff became evident during the final days of the French campaign, when Warlimont, anticipating that Hitler would ask Jodl how best to proceed after the signing of an armistice, began drafting plans for a tri-service invasion of England. Jodl disliked the idea of a cross-channel invasion and repeatedly countered his deputy's efforts by presenting his plans to Hitler as a "last resort". Jodl knew that Hitler shared his dislike of such an invasion, and that his leader's mind had already turned away from England toward Germany's traditional foe in the east. So while Warlimont and the other members of the OKW Operations Staff were drafting and redrafting plans for an attack on England, Jodl, their boss, was already discussing with the Führer how and when the Wehrmacht should attack Stalin's empire. Not that Jodl played a significant role in the conception of the strategic plan that eventually gained the illustrious name "Barbarossa". Hitler felt disappointed that Göring and his Luftwaffe had failed to deliver on their promise of annihilating the Allied Forces trapped at Dunkirk. He also realised that the Navy would play no real role in Barbarossa. Yet he delighted in the Army's marvellous work in France, which achieved in four weeks what he and other German soldiers had vainly struggled for during four long years in the Great War. Hitler therefore repaid the Army by allowing Brauchitsch, Halder and their operations officers to plan Soviet Russia's destruction. They planned not only their own service's operations, but, usurping the OKW's role, also those of the air fleets that would join them in the attack. Making clear that this was no business of the OKW, they even excluded Jodl from their major war games held in the Autumn of 1940. The latter got to do no more than comment on the plans as they appeared in their various forms, yet this was still more than Warlimont and the Operations Staff, supposedly the Wehrmacht's tri-service planning agency, ever did. They had no input into the largest joint campaign — indeed, the largest military undertaking of any kind — the world had ever seen. [p. 26] Hitler again rode roughshod over his generals. The OKH's plans called for Moscow's capture because this seemed the best way of forcing the Red Army, which would surely not abandon the capital, into a decisive battle that would end with its destruction. The OKW Operations Staff also expressed this view in its own appreciations, which Hitler merely glanced at and Jodl showed no desire to champion. The Führer had other ideas. He considered Moscow's capture less important than the exploitation of resources in the Ukraine and the clearing of the Baltic coast for trade and transportation purposes. He therefore redrafted the main Barbarossa plan to suit his own views, with the campaign's main effort now shifted from the centre to the wings. No-one resisted, at least not directly to him. In March 1941 the Operations Staff assumed responsibility for the Wehrmacht's proposed tri-service operations in and from Finland, which, coupled with Norway, still under the Staff s control, made the entire Scandinavian region — bar neutral Sweden — one large OKW theatre. Planning and executing the bi-service Balkans campaign also fell to the OKW, as did, in due course, the tri-service Mediterranean and North African campaigns. Thus, by December 1941, when Hitler's run of good fortune ground to a halt in the snows before Moscow — following a major and costly period of strategic dissension between Hitler and the OKH in July and August; Hitler naturally got his way — two separate and competing staffs provided planning and C3 (Command, Control and Communications) for Wehrmacht operations in the many theatres stretching from the tip of Norway to the deserts of North Africa. The OKH coordinated operations in the east, the critical theatre, while the tri-service OKW controlled operations everywhere else. This strange situation marked the end of the joint vision that Blomberg had once struggled for years to realise. [p. 27] Even in its "own" theatres, the OKW was incapable of functioning as an independent tri-­service planning agency with a uniform joint planning process. It simply lacked a number of essential administrative and command components and was forced to call for help upon agencies of the OKH, particularly the Army General Staff s intelligence, transportation, supply and administration sections. The OKW's lack of an adequate intelligence staff was a major weakness. It left the OKW dependent on the Army's intelligence staffs, which naturally reduced its ability to provide appreciations and devise strategies that differed markedly from those produced by the OKH's operations officers. On 19 December 1941 the situation became even stranger and the lines of command more confused when Brauchitsch resigned as the Army's C-in-C and Hitler — in an act without precedent — replaced him with the only person he considered up to the job: himself. Thus, the Supreme Commander of the tri-service Wehrmacht was also now directly in charge of one of the three services. Further torturing the chains of command, Hitler then appointed Keitel, who would remain Chief of the OKW, as Deputy C-in-C of the Army.43 Notions of service equality and overall command impartiality — nowadays considered by military commentators and theorists an integral part of jointness — permanently disappeared. As already noted, service equality had never been the Wehrmacht's strong point. The Army always considered itself the most important service, and treated the other two as mere Hilfswaffe. Göring's unique status and grand ego, on the other hand, meant that he never saw himself as merely one of three co-equal C-in-Cs. He consequently often competed with the others for resources and sometimes for glory in individual campaigns or operations. Hitler's self­-appointment as Army C-in-C naturally shattered any remnants of service equality. After all, how could the three services maintain even the appearance of equality when one — the service Hitler knew most about and always favoured — now had the Führer, Chancellor and Supreme Commander of the Armed Forces as its C-in-C? For the rest of the war the Wehrmacht struggled on with these muddled and totally ineffective arrangements, which forever ruled out a uniform joint planning process. The OKW and the OKH continued functioning as rival General Staffs, competing for resources and troops [p. 28] for their different theatres but never coordinating their plans and operations. The gulf between the OKW and the OKH widened dramatically when General Kurt Zeitzler succeeded the sacked Halder as the Army's Chief of Staff in September 1942 and immediately began to influence Hitler in favour of "their" theatre over the OKW's.44 Jodl had fallen from grace at precisely this time, so for several months found himself powerless to offset Zeitzler's partiality. Their divisions of responsibilities, combined with their intense rivalry and failure to work together on strategic issues, left Hitler as the only person capable of developing overall strategic plans and determining theatre priorities for the allocation of reserves — always in woefully short supply — and new equipment and the transfer of units. The competition between the OKW and the OKH was never fair. After Hitler became Army C-in-C, he became far more involved in operational and even tactical planning for the eastern front, the OKH's theatre. This resulted in the particular operational and tactical requirements of that theatre frequently taking precedence over all others, and thereby determining the allocation of men and materiel to all other theatres. The Battle of Kursk in July 1943 is a good example. Hitler ordered a massive build-up of armour and troops for the battle, disregarding protests from the OKW (although he "appreciated their point of view") that the inevitable losses at Kursk, even if it proved successful, would hamper defensive preparations for looming Allied offensives in the Mediterranean and, later, for the anticipated Anglo-American invasion of France.45 It is clear, then, that after Hitler divided his war into theatres run by rival planning and operations staffs, Blomberg's vision of a tri-service high command with a single joint operations staff that directed the overall conduct of war finally perished, the Nazi leader himself being its main destroyer. As Hitler's joint command agency, the OKW should have brought the services and their C-in-Cs together. Yet it failed to do so.46 The OKW neither held regular scheduled meetings attended by the service C-in-Cs or their Chiefs of Staff, nor apparently ever suggested doing so. The OKW did not even have a proper office near Hitler's mountain retreat in Berchtesgaden, Bavaria, where the Führer conducted much of his business even during wartime. Keitel lamented shortly before his execution in 1946 that, while Göring and several key Party and Reich [p. 29] Chancellery officials had residences in or around Berchtesgaden, "only the OKW, the High Command, lacked such a facility for its work. "47 The OKW Chief partly solved this problem in the summer of 1940 by taking over some space in the Reich Chancellery quarters and in the barracks at Berchtesgaden. This never proved adequate. Keitel complained that it resulted in "an enforced physical detachment of the OKW from the real governmental nerve centres and a lack of personal contact with the people that mattered." This unhelpful situation doubtless stemmed from what Keitel considered Hitler's desire "to make all his decisions himself and to sabotage any kind of community of effort." This was typical of the way Hitler managed his affairs. He hated adhering to routines and the timetables of others, preferring instead to hold meetings — including Cabinet sessions in the final pre-war years — when he considered them necessary and to summon only those whom he wanted to hear from or speak to. If he wanted to discuss Luftwaffe affairs, for example, he would summon Göring or Hans Jeschonnek, the Luftwaffe's young Chief of Staff. He would not bother calling for senior naval or army representation on those occasions, however, unless he considered the matter pertinent to both services. Naturally, this did not aid the development of jointness. Hitler did usually have military staff on hand, but most were adjutants — majors and colonels from the three services, working under the loose authority of Schmundt, OKW Adjutant since February 1938. These men mainly performed liaison functions between Hitler and the services or the OKW and the services. They were not expected, and were rarely asked, to provide counsel on important military matters. The Nazi leader also kept a few senior officers on hand, but he had chosen them as much for their compliant natures as for their professional competence, and the advice they gave often proved unhelpful. His closest advisors (who were seldom absent from him during wartime) were Keitel and Jodl. [p. 30] Keitel was a "yes man", excessively servile and seldom capable of disagreeing with Hitler. Not that he often wanted to; he considered it important to keep Hitler's spirits high, especially after the war began to sour in December 1941, and, in any event, he believed the myth of Hitler's military genius long after even most of the ideologically driven generals had seen through it. Jodl was cut from a different cloth. His loyalty to Hitler equalled Keitel's, but he expressed it otherwise, seeing himself more as a forthright counsellor than as an obedient assistant. He was also stronger than the OKW Chief and would disagree with Hitler on occasions, especially when he feared a needless loss of lives or when he considered it necessary to defend a colleague from unfair attack. Yet, after witnessing Hitler dish out numerous verbal lashings to displeasing officers, Jodl also usually found it "easier" to support the Führer's viewpoint. More importantly — at least for the purposes of this study — Keitel and Jodl were both army officers who, although they championed jointness, had never themselves served, trained, exercised or studied with the other services. They reflected this fact in their counsel to Hitler, which usually favoured the Army over the Luftwaffe and Navy and commonly exposed their ignorance of the needs, capabilities and limitations of air and naval forces. Their support of Hitler's decision to keep the Sixth Army supplied by air after its encirclement at Stalingrad is a case in point. The spontaneous and ill-considered (and soon regretted) assurance that the surprised and flustered Hans Jeschonnek gave on 20 November 1942 pleased and reassured Hitler, who wanted Stalingrad held at all costs. The Luftwaffe could sustain Sixth Army, Jeschonnek said, so why risk heavy losses withdrawing Sixth Army? Keitel, lacking the strength and desire to challenge his boss, acted true to form and told Hitler what he wanted to hear. "The Volga must be held! ... Sixth Army must hold out!" he repeatedly exclaimed.49 Although Jodl was no lackey, despite the efforts of many post-war writers to paint him as one, he was still smarting from the rough treatment Hitler had dished out when he sided with Field Marshal List in September.50 He was not yet ready to receive more. He therefore gave Hitler far more cautious but still agreeable advice: although Sixth Army was certainly in a predicament, he argued, and its destruction looked certain if relief was not forthcoming, the vast territorial gains made during the summer campaign should not be abandoned before a relief effort was attempted. In the meantime, the Luftwaffe could and should keep Sixth Army supplied by airlifting in the required food, fuel and ammunition. [p. 31] Keitel and Jodl gave their advice spontaneously without consulting with their staffs or undertaking any investigation into the Luftwaffe's ability to perform the massive airlift operation. They would surely not have given this advice if they had any significant knowledge of the Luftwaffe's limits and capabilities in general, and the relevant air fleet's (Luftflotte 4) composition, current complement and state of operational readiness in particular. Their uninformed advice proved wildly optimistic, as subsequent events tragically demonstrated, yet it persuaded Hitler that Stalingrad should be held. This was neither the first nor the last time that Keitel and Jodl, both "army men" by experience and inclination, like their boss, provided counsel that showed their unfamiliarity with airpower and seapower. Still, until he fell from grace after the Stalingrad catastrophe, Hermann Göring retained considerable prestige in Hitler's court and — although inept as an air commander himself — often managed to offset the poor advice given by the OKW leaders. Yet, as already noted, Göring's elevated status always worked against all notions of jointness. First, it inflated Göring's ego to such an extent that he found it difficult during Blomberg's years as War Minister to submit to his authority and consequently tried to circumvent him, by going directly to Hitler, on many occasions. Second, when the issue of Blomberg's succession arose in January 1938, Hitler found himself unable to appoint another tri-service Wehrmacht C-in-C because he knew that Göring, although not suitable for the job himself, had become so important, and self-important, that he would accept no-one over him save Hitler himself. Hitler made this problem worse by giving Göring a consolation prize; on 4 February 1938, the very day he named himself Supreme Commander of the Wehrmacht, he raised Göring to the lofty rank of Field Marshal. This elevated him above Keitel as well as Brauchitsch and Raeder, the other two service C-in-Cs. Göring always demanded thereafter that others respected his seniority. Not only was he the Führer's right-hand man, but he was also — if we exclude Hitler — the Reich's first soldier. He would never again consider himself on a par with the other C-in-Cs, not even as a "first among equals". Hitler made the problem worse on 19 July 1940 by promoting him to Reichsmarschall (Imperial Marshal), a status held only once in Germanic history, and that was two centuries earlier by Prince Eugen of Savoy. This grand rank, equivalent to a six-star general, made Göring the highest ranking officer not only in Germany, but in all the world. [p. 32] Hitler certainly realised — indeed, intended — this when he bestowed the unique honour. Yet it came with a heavy price tag, one that Hitler himself would use to his advantage. For instance, on 6 February 1943, less than a week after the surrender at Stalingrad, the Führer informed a frustrated Field Marshal Erich von Manstein that the creation of a new, tri-service joint command, or even the appointment of a single Joint Chief of Staff, which Manstein had meekly advocated, was entirely out of the question.51 Feigning unhappiness, Hitler explained that Göring, as his deputy and the only Reichsmarschall, could not possibly submit to anyone else's authority but his. This was an "understandable position" given that he was far- senior in rank to the OKW leaders and Dönitz, who had succeeded Raeder as the Navy's C-in-C only a week earlier. The Nazi leader was correct about Göring's formal status, but he used this as an excuse to avoid confronting the real reason for not appointing a single tri-service commander responsible for the war's overall conduct: he felt that such an appointment, even if it went to Göring and not to one of the military professionals — such as Manstein, whom most senior officers favoured as tri-service Chief of Staff or Generalissimo — would shatter the largely-self-generated myth of his military "Midas touch" and generally diminish his prestige. This was out of the question. Hitler's comments to Manstein after the Stalingrad disaster may not have been entirely forthright, but they still reveal what wartime patterns of behaviour had already proven: that equality of service representation at the highest levels simply did not exist. Influence in the OKW and in the higher echelons of the Wehrmacht derived not only from rank, position or personal merit, but also from personality and Hitler's frequently misguided loyalties. As a result, competition for Hitler's favour became fierce among his courtiers, including his own military advisors and the chiefs of land, sea and air forces, creating a situation which exacerbated inter-­service tensions and diminished jointness. This study has focused mainly on the degree of jointness within Hitler's highest command structures, and has shown that the Nazi leader's views on strategic and operational planning and on command arrangements seemed promising before and immediately following the events of February 1938. It has also shown that he subsequently failed to produce positive results — and, indeed, that he produced detrimental results — because of his typically dictatorial "divide and rule" style of leadership. By now turning to the operational level, it becomes clear that Hitler also did little to facilitate jointness among his services and their combat commanders. Hitler appointed numerous theatre commanders during the war, giving each operational responsibility for one of the "OKW theatres" — including the North (Scandinavia), the West (the Low Countries and France), the South (the Mediterranean and North Africa) and the Southeast (the Balkans and the Aegean Sea) — and making them answerable only to him via Jodl and the OKW. According to Keitel, these men should have received full authority over the services in their theatres and commanded, under the guidance of the OKW, with what he called a "joint-service warrant ".54 Yet Keitel added that Hitler actually empowered very few with real authority [p. 34] over the three services, mainly because, he claimed, Göring and Raeder resented placing their air and naval units under the command of theatre commanders, "almost all of whom were army generals". Keitel is correct about Görings and Readers resistance to the subordination of their units to army generals, yet he is wrong on two counts. First, several theatre commanders actually came from the Luftwaffe, including Albert Kesselring and Alexander Lohr, discussed below. Second, and more important, Hitler was as much to blame for the limitations on theatre commanders' powers as were Göring and Raeder. He clearly saw value in placing various theatres under the stewardship of trusted commanders and empowering them with tri-service authority. He would not have made so many of these appointments if he considered them worthless. Yet, because he often gave in to the service C-in-Cs' protests, and because his inability to delegate power left him constantly interfering in the theatre commanders' business, he undid much of the benefit that he might otherwise have gained by their appointment. The most notable of these tri-service theatre commanders — who correspond in many ways to what we now term Joint Task Force Commanders — was that of Field Marshal Albert Kesselring, whom Hitler appointed Commander-in-Chief, South (Oberbefehlshaber Süd), with authority over all Wehrmacht and other Axis forces in the Mediterranean. He held this position from 2 December 1941 until shortly before the war in Europe ended.55 Kesselring probably came closer than any other Wehrmacht leader to functioning as a modern joint force commander. He created a tri-service and multi-national staff (including Italians), with several members carefully chosen and assigned in such a manner as to ensure that he remained fully cognisant of the needs, capabilities and limitations of all land, sea and air forces at his disposal. He also put in place a rudimentary (by today's standard) joint operational planning process — a system allowing him to determine the best method of accomplishing assigned tasks and to command and control the forces needed to perform them. Yet the power-selfish Hitler never allowed Kesselring free rein, constantly interfered in his planning process and seldom even supported him when subordinates rejected his unique authority.56 Kesselring found Rommel particularly troublesome, and gained little help from the Führer, who, according to Kesselring, initially fell under Rommel's "hypnotic influence". Hitler's [p. 35] dealings with these two commanders were typical of the pattern that has so far emerged in this study: the Nazi leader seemed happy to play off one commander against the other, even on major strategic issues,57 so that he could, by way of his arbitration, retain a high degree of control over what transpired in North Africa and the Mediterranean. All in all, Kesselring found his ability to exercise real tri-service authority in the Mediterranean to be severely restricted. Nevertheless, Kesselring managed better and lasted longer than other tri-service theatre commanders. Most times that Hitler made these appointments, he did so only as a temporary measure to solve a crisis that had stumped him. At the height of the Stalingrad crisis, for instance, it became clear that Manstein and Richthofen, the local Army and Luftwaffe commanders, were powerless to help Sixth Army. In a last-ditch effort to improve the situation, Hitler ordered Field Marshal Erhard Milch of the Luftwaffe to fly to southern Russia to take charge of the entire airlift effort. He granted him "special powers and authority to issue orders and instructions to every section of the armed forces [in the region]58. Milch was a dynamic leader and an outstanding administrator. He displayed excellent managerial skills during the final days of the Stalingrad airlift. Yet he arrived too late to make a substantial difference to its progress and, despite using his "special powers" as a joint task force commander, was no more able to overcome adverse weather conditions and overwhelming enemy air and ground superiority than local land and air commanders had been. His command of all Wehrmacht forces in the Stalingrad sector lasted less than three weeks. After Sixth Army surrendered, Hitler recalled him to Berlin and left Manstein and Richthofen once again to coordinate the employment of their forces. The rarity of these appointments, both long-term and short-term, stemmed not only from Hitler's self-perception as a military genius, who could and should direct most operations himself, [p. 36] but also from his unwillingness to create a fuss, something he always hated. Having his subordinates compete for his favour was one thing; having them argue with him over the deployment of their forces was quite another. Yet despite his omnipotence as Führer, and the obvious operational advantages of unified command, Hitler decided not to ignore what Jodl referred to in his diary as Göring's "furious" complaints62 — although he subsequently banned him from further planning meetings for a month63 — or overrule the strong objections of senior naval and air force staff officers. The latter resented subordinating their forces to a land commander. Falkenhorst, they said — trying to disguise their real motive: inter-service jealousies — did not possess adequate experience with their services. Consequently, Hitler kept the operation under his own personal command, which, to Keitel's delight, he exercised through the OKW. He gave poor Falkenhorst the grand but worthless title of Senior Commander, but left him no real command authority over participating naval and air forces. Raeder and Göring retained that authority, leaving Falkenhorst to make "suggestions" and "requests" via Jodl to Hitler, who would have the final say after consulting with his C-in-Cs. This may have given Jodl and the OKW unprecedented joint authority, as noted above, but it clearly undermined the Wehrmacht's jointness at the "sharp end" of the operation. Hitler found it easier to appoint joint commanders in non-combat zones of occupation, mainly because he ran no risk of being upstaged by them (as he often feared he would be by successful combat commanders) and because the service chiefs themselves were more agreeable to subordination of their forces to a joint commander where no opportunities for glory in combat existed. When planning and conducting major operations, they often bickered over the orientation of their forces and competed not only for higher shares of Germany's meagre resources, but also [p. 37] for opportunities for glory in battle. Yet they seldom squabbled over inter-service matters in quiet theatres or occupation zones. For example, no dissension followed Hitler's 8 August 1942 appointment of General Lohr, former head of a Luftwaffe air fleet, as Wehrmacht Commander, Southeast (Wehrmachtbefehlshaber Südost), with command authority over all German forces in the relatively quiet Balkans. Still, these command appointments to occupation zones later proved costly. After liberation, the occupied peoples generally wanted revenge against their former overlords. Lohr fell victim to this desire. Following a flimsy trial, he was executed for alleged war crimes by the Yugoslavs in 1947. Despite Hitler's appointment of tri-service theatre commanders in the various "OKW theatres," he made no similar appointments — except for one or two of the temporary "emergency" appointments described above — in the most decisive theatre of all: the eastern front. In that vast and virtually unmanageable theatre, which he oversaw directly in his capacity as Army C-in-C, he actually left most combat zones and sectors without joint command. Instead, he selected capable Army generals to command ground formations and capable Luftwaffe and Navy generals or admirals to command their formations. He then expected them to perform their functions in loose cooperation as equals according to the commands they received from the OKH or their individual service high commands. It must be said, of course, that the Wehrmacht seldom conducted operations using all three services. With the notable exception of the invasion of Scandinavia in 1940, and the less notable exceptions of troop transportation and logistics missions across the Mediterranean to North Africa, the German Navy conducted no significant missions alongside both the Army and the Air Force. Usually it operated alone, or with the Luftwaffe providing air cover and reconnaissance information. It is certainly true that on the eastern front the Army and the Air Force performed the lion's share of the fighting, with the Navy having only a small presence in the Baltic Sea and the Black Sea. So how were Army and Luftwaffe commanders — the most common joint combination —­ supposed to integrate their services and employ them jointly when neither of them, and no-one else, received Hitler's formal and explicit appointment as a combat theatre commander with authority over all participating forces? The answer is clear: after burying any service biases they might have, ground and air commanders were simply supposed to deal directly with each other as [p. 38] "Partners" of equal status and try to agree on how best to deploy their respective forces. They had to conjure up a spirit of jointness; a difficult task without a formal chain of command involving members of all or both services and without any formalised concept of equality. Making that task more difficult was the eastern front's division into combat zones that corresponded not to geographical features, but directly to the physical spread of units in each army group. The southern combat zone, for example, finished exactly where the last battalion of Army Group South fought, right alongside the first battalion of Army Group Centre, which marked the boundary for the central zone. This seemed to establish army groups as the superior commands, with air fleets being operationally subordinate. This was not the case — both were formally equal in status — but in practice it usually resulted in the Army gaining the Luftwaffe's operational subordination. Neither Hitler nor the OKH (the OKW's exclusion from eastern operations remained until war's end) seemed concerned by this state of affairs. Throughout the Second World War the success of ground and air commanders' efforts to work harmoniously as equals varied greatly and depended largely on the personalities and professionalism of the individual commanders involved. At Stalingrad, for instance, the Army commander, General Friedrich Paulus, and the local air corps commander, General Martin Fiebig, simply could not get along. Accordingly, despite the reasonable performance of each individual service, their level of inter-service cooperation remained relatively low. Rommel and his Luftwaffe counterpart, General Otto Hoffman von Waldau, did not perform any better in North Africa. Yet in several other cases — such as the Crimean campaign of mid-1942 and the Kharkov counteroffensive of early 1943, both involving Manstein and Richthofen — the harmonious cooperation achieved by the operational Army and Luftwaffe commanders produced a unity of command and a degree of inter-service cooperation seldom equalled during the war. Hitler could have done more to enhance jointness at the "sharp end" of operations by appointing tri-service theatre commanders in the east as he had in the OKW theatres; and, of course, by trusting them once appointed. He did try to place combat zones under operational commanders who possessed at least a rudimentary understanding of the tactics, techniques, needs, capabilities and limitations of each of the participating services. Yet he did not formally empower them with joint command authority and he did not create joint staffs. [p. 39] Appointing joint commanders in the east probably never occurred to him (or the OKH, which would not have suggested it even if it had). Hitler could not shake off his partiality towards the Army, and, like Stalin, he did not fully grasp the fact that, while his eastern armies did possess far more men than his eastern air fleets, airpower had an impact on battle that could not be calculated on the basis of manpower. The Army's numerical superiority did not automatically make it more important. Assuming that Hitler could have conceived of his armed forces in other terms, however, would be anachronistic. He was innovative in many regards, yet ultimately remained a man of his time, constrained not only by his own experience of war but also by concepts and practices so long established in the German tradition that they would seldom — if ever — have featured in his thinking. To sum up, then, this study has shown that Hitler played a central role in defining the degree of jointness in the Wehrmacht. During the five years from his assumption of power in January 1933 to his reorganisation of the Wehrmacht command in February 1938 he helped the German armed forces to make significant strides towards jointness. His help took the form of open support for Blomberg's ideas, which were both innovative and contentious. He not only permitted Blomberg and Keitel, his assistant for most of that period, to pursue their vision of integrating the three services and placing them under unified command, but he also explicitly endorsed that vision in a series of moves. Most important was the Military Service Act of 21 May 1935, which gave Blomberg unprecedented command authority over the three services and made him, in effect, the world's first modern joint commander. Hitler made this radical departure from German military tradition even though he realised it angered many senior officers. The dictator continued the process set in train by Blomberg even after the latter's resignation in 1938. He formalised existing practices by creating a newly designated command structure, the OKW, a step that, as Keitel rightly observed, served as a "mere continuation" of Blomberg's efforts to enhance Wehrmacht jointness. The OKW was the world's first true joint command structure, as many German generals noted with satisfaction after the war. [p. 40] Hitler's role in these developments was rather like that of his contribution to Blitzkrieg. He did not conceive the concept — Blomberg and Reichenau deserve the laurels for Wehrmacht jointness just as Guderian and others do for the stunning new armoured tactics — but he liked new ideas, considered this one worthy and became its patron. After creating the OKW; however, Hitler quickly demonstrated that jointness would stagnate under his stewardship. He maintained his power by dividing subordinates, and in this way turned the OKW against the service C-in-Cs and their command staffs. He also paid lip service to the OKW, using it more as his personal staff than as the Wehrmacht's tri-service planning and command agency. Even when he divided his war into competing theatres, with the OKH controlling the eastern front and the OKW all the other regions, he proved lousy at delegation and interfered in every significant issue. Neither Keitel nor Jodl, the OKW's operations chief, could create a joint planning process in this chaotic command environment. Instead, the Wehrmacht prosecuted the Second World War with no real unity at the top. Although Hitler did understand the value of integrating his land, sea and air forces and placing them under a unified command, his "divide and rule" leadership style and his inability to delegate destroyed any chance that this would happen. Even in campaigns such as the invasion of Scandinavia, which came closest to being a truly joint operation, he played off service C-in-Cs against each other, denied full tri-service authority to Falkenhorst, his joint task force commander, and openly favoured Göring over the other C-in-Cs. Only Jodl managed during that campaign to impose any jointness, but his outstanding work was soon forgotten. Although he remained Hitler's closest military advisor until the end of the war, he never again received free rein as a joint commander. Hitler's appointment of joint theatre commanders was a promising start, but, here again, his compulsive meddling and "divide and rule" leadership eroded virtually all joint command. The only times that he actually released the reins were crisis periods, when he empowered officers with full joint authority in last-ditch attempts to save problems that had beaten him. By then, of course, it proved too late for the unfortunate officers to exercise much power anyway. [p. 41] Most air, sea and land commanders had to create their own jointness in an ad hoc fashion, which generally produced adequate results and sometimes excellent results. For excellence to become the norm, though, the Wehrmacht would have needed a formal chain of command involving members of all or both services and a formalised concept of equality. Neither existed, due in large part to Hitler's ignorance during wartime of the very concept he had earlier supported. On balance, one must say that, while Hitler diminished the Wehrmacht's jointness because of his inadequacies as a leader, it seems unlikely that jointness would have improved were he not Supreme Commander. The services themselves opposed each other almost as much as they opposed the idea of a united command structure imposing its will upon them from above. Even when we remove Hitler from these considerations, the fact remains that the jointness the world's armed forces now want and try to attain was foreign to the German tradition and could not have existed in the 1930s and 1940s. 1. United States War Department, Handbook of German Military Forces (Washington, DC: 1941), p. 15. 2. Office of the chief of Military History, (US) Department of the Army, MS # T-101: General August Winter. et al., The German Armed Forces High Command: A Critical Historical Study of Its Development, Organization, Missions, and Functioning from 1938 to 1945, Vol 1, Chap. 1a, p. 17. 3. M. Domarus, Hitler: Reden und Proklamationen 1932-1945 (Leonberg: Pamminger, 1973), Vol 1, pp. 429-430. 4. Annex to source cited in note 2, p. 3. 5. H. Deutsch, Hitler and His Generals: The Hidden Crisis, January-June 1938 (Minneapolis: University of Minnesota Press, 1974), p. 24. 6. J.W. Wheeler-Bennett, The Nemesis of Power: The German Army in Politics 1918-1945 (London: Macmillan, 1967), p. 340. 7. Office of the Chief of Military History, [US] Department of the Army, MS # T-101 K1: General Walter Warlimont, Commentary on Manuscript T-101, p. 2; W. Warlimont, Im Hauptquartier der Deutschen Wehrmacht, 1939 bis 1945 (Augsburg: Weltbild, 1990. First Published 1962), Vol 1, pp. 21, 22. 8. Office of the chief of Military History, [US] Department of the Army, MS # T-113: General Heinz Guderian, Unification or Coordination: The Armed Forces Problem, p. 4. 9. Cf. Vice Admiral Friedrich Ruge, "German Supreme Command (OKW)", unpublished manuscript in the microfilm collection, Essays by German Officers and Officials on World War II (Wilmington, Del: Scholarly Resources), p. 8; Vice Admiral Leopold Burkner, "Top Structure of the Former German Armed Forces", p. 14, in ibid. ; source cited in note 21, p. 18. 10. Domarus, Hitler: Reden und Proklamationen, Vol 1, p. 294. 11. Ibid., Vo12, p. 619. 12. A good analysis of the Wehrmacht Academy is found in H-G Model, Der deutsche Generalstaboffizier (Frankfurt a.M: Bernard und Graefe, 1968), pp. 105-107; see also T.N. Dupuy, The German General Staff, Institute of Demonstrated Excellence: An Exploratory Monograph (Falls Church, VA: NOVA, n.d), pp. Cl-C4. 13. Ruge, "German Supreme Command (OKW)". 15. BA/MA RL 211/164: Genstab. 3. Abt, Richtlinien für die Ausbildung auf der Höheren Luftwaffenschule und auf der Luftkriegsakademie, 5 July 1937. 16. This directive appears as Document 175-C in the records of the International Military Tribunal. 17. Office of the Chief of Military History,[US] Department of Army, MS # T-101 Annex 1a: Memorandum of Colonel General von FRITSCH presented to General Field Marshal von BLOMBERG in August 1937. 18. F. Hossbach, Swischen Wehrmacht und Hitler 1934-1938 (Göttingen, 1965), p.119. 19. Office of the Chief of Military History, [US] Department of the Army, MS # T-101, Annex 1C: Field Marshal Wilhelm Keitel, Chief of the Armed Forces High Command: The Conduct of the War as an Organisational Problem. Viewpoint of the OKW on the Study of the Commander in Chief of the Army on the "Organisation of the Armed Forces High Command", 19 April 1938, p. 13. 20. See Jodl's diary entries for 20-26 September 1937, and Warlimont's accompanying commentary, in The Jodl Diaries (1937-1045) with Annotations by General der Artillerie Walter Warlimont, courtesy of David Irving's microfilm collection, Reel DJ-84; Domarus, Hitler: Reden und Proklamationen, Vo12, pp. 732, 734. 21. W. Goerlitz, ed., The Memoirs of Field Marshal Keitel (London: William Kimber,1965), p. 37. 22. Office of the Chief of Military History, [US] Department of the Army, MS # T-113: General Heinz Guderian, Unification or Coordination: The Armed Forces Problem, p. 5. 23. Office of the Chief of Military History, [US] Department of the Army, MS # C-070: General Walter Warlimont, The Unification Problem: Some Lessons From the German Experience, p. 30. 24. Jodl's diary entry for 26 January 1938 (cited above in note 20). 25. Ibid., entry for 27 January 1938. 27. Office of the Chief of Military History, [US] Department of the Army, MS # T-101 K1: General Walter Warlimont, Commentary on Manuscript T-1O1, p-8­. 28. Office of the Chief of Military History, [US] Department of the Army, MS # T-101 Annex 1B: Memorandum of 7 March 1938 submitted by BRAUCHITSCH, Commander-in-Chief of the Army, to the Armed Forces High Command. 29. Cited above in note 19. 30. Jodl's diary entry for 18 February 1938 (cited above in note 20). 31. MS # T-101 K1: General Walter Warlimont, Commentary on Manuscript T-101, p.8. 32. Warlimont, Im Hauptquartier der deutschen Wehrmacht, Vol 1, p. 34. 33. Ibid., Vol l, p. 46. 34. See Jodl's diary entries for February 1940 (cited above in note 20); Warlimont, Im Hauptquartier der deutschen Wehrmacht, Vol 1, p. 66. 35. Ibid, Vol 1, p. 87. 36. See Jodl's diary entry for 23 January 1940 (cited above in note 20). 37. Ibid., entry for 19 February 1940. 38. Office of the Chief of Military History, [US) Department of the Army, MS # T-101 K1: General Walter Warlimont, Commentary on Manuscript T-101, p. 38. 39. Goerlitz, The Memoirs of Field Marshal Keitel, pp. 104-105. 40. Office of the Chief of Military History, [US] Department of the army, MS # T-101 K1: General Walter Warlimont, Commentary on Manuscript T-101, p.39. 41. Goerlitz, The Memoirs of Field Marshal Keitel, pp. 154-155. 42. Office of the chief of Military History, [US] Department of the Army, MS # T-101: General August Winter et al., The German Armed forces High Command, Vol III, Chap B la, pp.25-26. 43. Ibid., Vol 1, Chap 3, p. 45. 44. Goerlitz, The Memoirs of Field Marshal Keitel, p. 184. 45. Office of the Chief of Military History, [USA] Department of the Army, MS # T-142: General Heinz Guderian, The Interrelationship Between the Eastern and Western Front, p. 21; Warlimont, Im Hauptquartier der deutschen Wehrmacht, Vo12, p.347. 46. Ibid., Vol 1, p. 133. 47. Goerlitz, The Memoirs of Field Marshal Keitel, p. 85. 48. Warlimont, Im Hauptquartier der deutschen Wehrmacht, Vol 1, p. 133. 49. I analyse these events in my article, "Stalingrad: An Examination of Hitler's Decision to Airlift", Airpower Journal, Vol XI, No 1 (Spring 1997), pp. 21-37. 50. For Jodl's courageous stand on behalf of Field Marshal List, see my book, Stopped at Stalingrad: The Luftwaffe and Hitler's Defeat in the East 1942-1943 (Lawrence, KS. : University Press of Kansas, 1998) p. 171. 52. BA/MA N671/10: Dr Wolfram Frhr von Richthofen, Generalfeldmarschall. Personliches Kriegstagebuch: Band 10, entry for 11 February 1943. 53. MS # T-113: General Heinz Guderian, Unification or Coordination, p.6. 54. Goerlitz, The Memoirs of Field Marshal Keitel, p. 155. 55. A. Kesselring, The Memoirs of Field Marshall Kesselring (London: Greenhill Books, 1988), p. 103. 56. Cf. S. Bidwell, Kesselring, in C. Barnett, ed., Hitler's Generals (London: Phoenix Giants, 1996), p.277; Kesselring, Memoirs, pp. 103ff. 57. Cf. ibid., p. 124. 58. United States Air Force Historical Research Agency 168.7158-337: Kriegstagebuch Sonderstab Generalfeldmarschall Milch, entry for 15 January 1943; P.E. Schramm, ed., Kriegstagebuch des Oberkommandos der Wehrmacht (Wehrmachführungsstab) 1940-1945 (Frankfurt am Main: Bernard & Graefe, 1961-1965), Vol III, p. 42, entry for 15 January 1943. 59. Kesselring, Memoirs, p. 239. 60. R. Knauss, Der Feldzug in Norwegen 1940 (this unpublished manuscript by a Luftwaffe officer on Falkenhorst's staff is from the collection of Professor James S. Corum, School of Advanced Airpower Studies, Air University), p.18. 61. Weisung Nr. I0a, in W. Hubatsch, ed., Hitlers Weisungen fur die Kriegführung 1939-1945: Dokumente des Oberkommandos der Wehrmacht (Frankfurt am Main: Bernard & Graefe, 1962), pp.47-50; F. Halder, Kriegstagebuch: Tägliche Aufzeichnungen des Chefs des Generalstabes des Heeres 1939-1942 (Stuttgart: Kohlhammer, 1965), Vol 1, entry for 21 February 1940. 62. See Jodl's diary entries for 3, 4 and 5 March 1940 (cited above in note 20). 63. D. Irving, Göring: A Biography (London: Macmillan, 1989), p. 285.